When 83-year-old Norma Izard stepped into Lord's early on July 23 last year, she could hardly have predicted the events that would unfold. A sellout crowd jostling into the ground, a match-winning wonder spell from Anya Shrubsole, and tears all round as England Women lifted the World Cup. But the most amazing thing was that Izard was watching these scenes from the pavilion. Twenty-four years earlier, as manager of the 1993 England Women, she had witnessed another World Cup win at Lord's. On that occasion, however, while Izard's husband - an MCC member - had been welcomed into the pavilion, Izard herself had been barred from it by virtue of her gender. "The room I was put in was miles from anywhere," she recalls. By 2017, she had an honorary lifetime membership of MCC to her name, and with it a box seat. 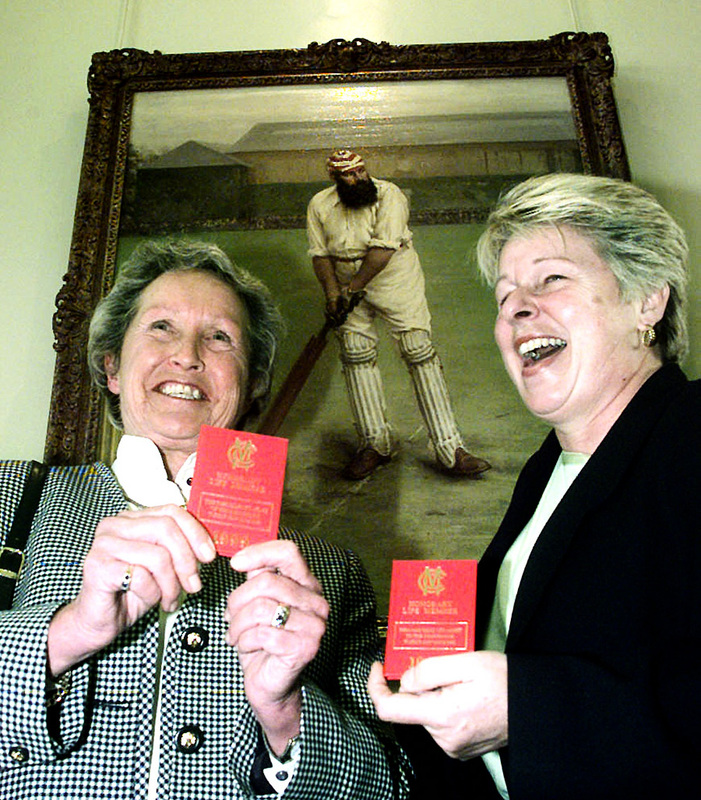 Today marks the 20th anniversary of the vote to grant women membership of the Marylebone Cricket Club. On September 27, 1998, at an Extraordinary General Meeting of the club, 70% of members voted in favour of accepting women members. It was the culmination of a campaign that had rumbled on for seven years, and a change that had been fiercely resisted by many club stalwarts. "We haven't invaded the place with knitting needles and breastfeeding like they said we would in the 1990s," reflects BBC commentator and MCC member Isabelle Duncan 20 years on. "They've realised that we're not aliens!" She should know. Duncan was thrust into the centre of the campaign for female membership in 1998 when she appeared on the front of Wisden Cricket Monthly (WCM) magazine sporting an MCC sweater, and is the only woman currently sitting on the main MCC Committee. She was plucked out of relative obscurity for the cover shoot. At the time she was a club cricketer in Surrey and sometimes captained her otherwise male side. "I didn't really know what I was getting into," she recalls, "but I thought it sounded like a good idea." As she tells it, she was approached by the magazine, who were doing an issue on women's cricket and decided that they wanted a female on the front, wearing an MCC sweater. "I'd played cricket against one or two of the journalists who wrote for WCM at the time and they remembered me." "I was more of a flagship in saying to people, 'Come on, this is an important issue, you must vote.' Looking back on it I'm really glad I was involved because it was so important. You don't really appreciate that when you're 24. But now I look back on it and think, 'Yes, it was a turning point.'" The woman behind the original campaign for female membership was the indefatigable former England captain Rachael Heyhoe-Flint. In 1991, she applied for club membership, supported by famous names that included Tim Rice, Dennis Amiss and Brian Johnston. "I've played cricket all my life, I got to the top, and I just wanted to become a member of this club," Heyhoe-Flint told me in an interview in 2014. "It wasn't about demanding special treatment. I had to try to persuade 18,000 men - the members - that it wouldn't be too detrimental to enable women to apply in exactly the same way as men." The issue was brought before the membership at the 1991 AGM but the initial vote went overwhelmingly against Heyhoe-Flint: 2371 to 4727. Nonetheless she continued to campaign. When Colin Ingleby-MacKenzie was elected MCC president in 1996, he launched his presidency with the statement that he supported female membership. 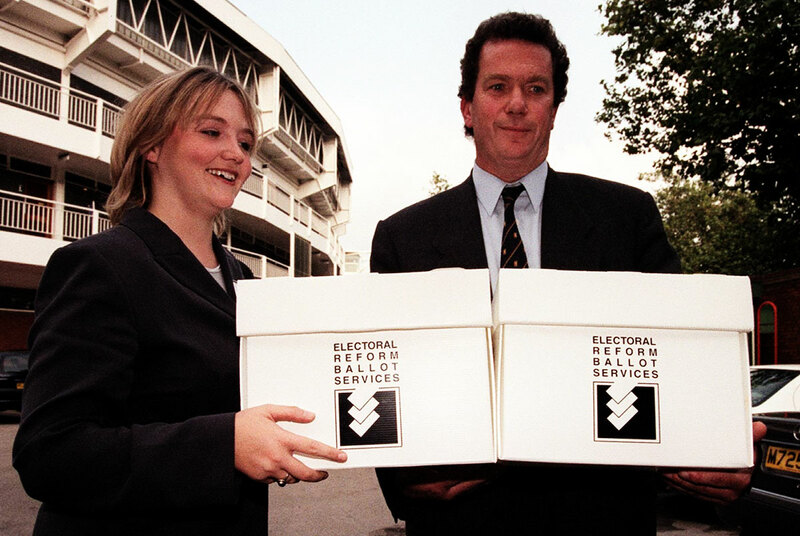 Another vote was scheduled for February 1998. By that time opinion had shifted: 56% of the membership voted in favour of admitting women. Yet the necessary two-thirds majority needed to secure a change in the rules was still not secured. The statements bandied around at that time by some members have not survived the test of time particularly well. An insider's account of the February 1998 meeting, published in WCM in April that year, is revealing. "One member claimed the Long Room would resound to the clattering of teacups," it read. "It was suggested that the MCC shop would become a boutique full of egg-and-bacon twinsets. One member wondered if women would be able to afford the annual subscription, currently £173. Most hilarious of all was the member who said he got up at the crack of dawn on match days to reserve his favourite seat, but as a gentleman, he would have to give this up to a late-arriving lady." Another member was quoted in the press as saying: "I think it's a good thing that there is still somewhere where males can be without females. Women can be a little irritating, it's the female temperament: it leads to irritation." David Gower was reported to have said that the pavilion was "not a place I'd send my wife". Perhaps all this was not so surprising. Such attitudes were perfectly consistent with the way the MCC had always treated the Women's Cricket Association: it took 47 years of trying before they could persuade the club to host a women's match at Lord's. Even after their request was granted and a women's ODI against Australia was staged at the ground in 1976, women did not play there again for 11 years. The campaign for female membership reached its final conclusion on September 17, 1998, the requisite majority secured at long last. Six months later Izard, Heyhoe-Flint and eight other women received a letter from MCC Secretary Roger Knight. 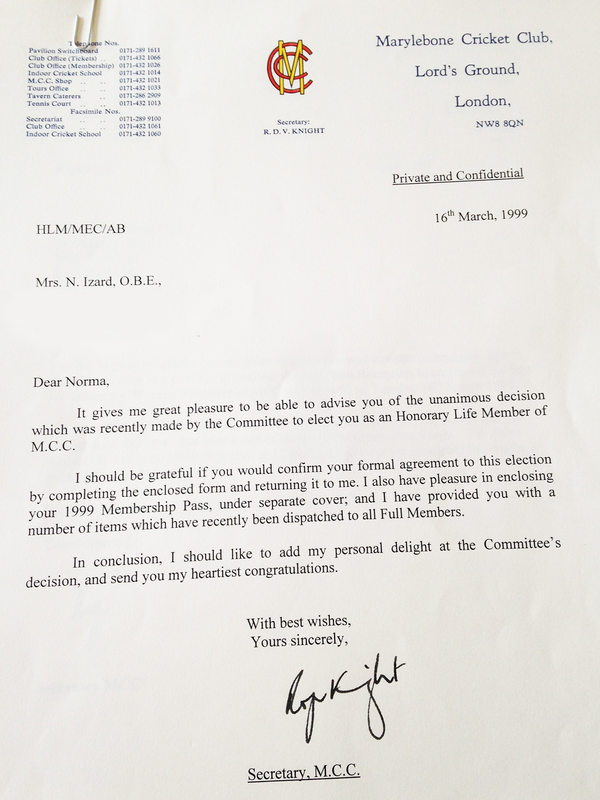 "It gives me great pleasure to be able to advise you of the unanimous decision which was recently made by the Committee to elect you as an Honorary Life Member of MCC," the letter read. "I have pleasure in enclosing your 1999 Membership Pass. I should like to add my personal delight at the Committee's decision, and send you my heartiest congratulations." Even so, there remained a feeling that the club was embracing women only reluctantly. At least some members felt they had had no choice but to vote in favour of female membership after the MCC was prevented from applying for lottery money to fund redevelopment because of their men-only rule. A male-only bar was retained within the pavilion as a final bastion for members who had disagreed with the vote. Some of the entrenched club attitudes towards women would, it seemed, not shift overnight. Certainly, in membership terms, the club has largely remained a hub of masculinity, thanks partly to the long waiting list: 20 years for those women who chose to apply in 1998; 30 years if you wrote your name down today. Playing membership has been on fast-track route into the club for women. Less than 12 months after the vote, the first ever MCC Women's team took to the pitch against a Surrey Under-21 side, playing in egg-and-bacon culottes; MCC Women currently play 25 matches a year. 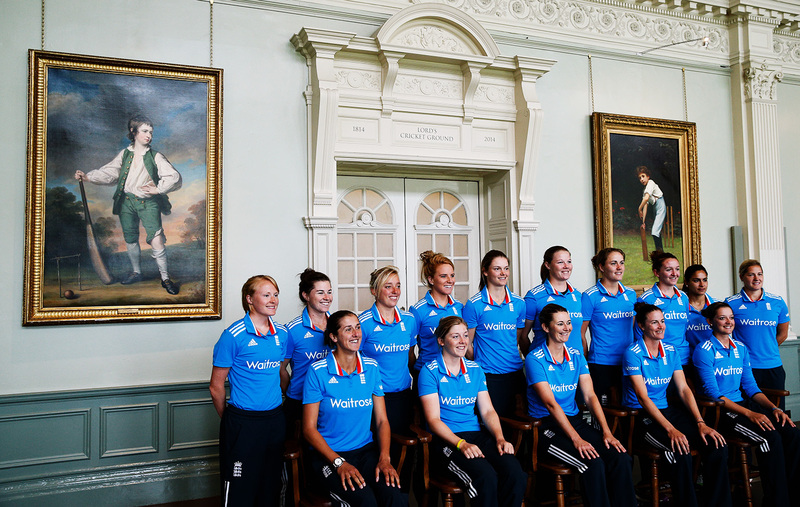 Last winter a women's academy was launched at Lord's, jointly funded by MCC and Middlesex. Fourteen players have already graduated from the programme: one, Naomi Dattani, recently turned out for Western Storm in the Kia Super League. Yet MCC's Kate Matheve, who has worked in the Cricket Office since 2000, sounds a note of caution. "Female membership has grown, but I think people had this idea that there would be a much faster growth. In reality we're struggling to find people. It was such a big thing at the beginning, when suddenly you could join and women had that feeling that it had been denied to them. Nowadays for women who were born 20 years ago, MCC membership isn't seen as particularly special because you can just have it." She is right, as far as that goes. Despite the best efforts of MCC head of women's cricket Danni Warren and her team, there are only about 100 female playing members of MCC, and just 600 female members overall out of 23,000. And yet to look at the impact of the 1998 vote purely in numerical terms would be a mistake. Its real significance was always much more symbolic than that. By the mid-1990s, Lord's remained the only pavilion in England from which women - even female members of Middlesex - were barred on international match days. International women's sides, meanwhile, on the two occasions they played at Lord's in the '90s, were instructed to "hurry through" the Long Room on their way out to the field. Lancashire, the last holdout among the counties, had admitted women to full membership in December 1989, at an AGM that gained notoriety when it was revealed that the club had unknowingly gained its first female member years earlier, by virtue of gender-reassignment surgery. "Mr Keith Hull (otherwise known as Stephanie Lloyd) advised the Meeting that by a legal technicality he was the Club's first full female Member," the minutes read. Further afield, the MCC's Australian counterpart, the Melbourne Cricket Club, had abandoned its men-only status in 1984, after the Victorian state government threatened to end the club's lease if it did not do so. Three years later the Gabba followed suit. Rather than take impetus from these examples, though, MCC members appeared to relish the feeling of being under siege, arguing ever more strongly that their club was the last place of masculine retreat in a changing cricketing landscape. "We don't want Germaine Greer and her pals tramping through our pavilion just to please the bloody Lottery," one MCC member was quoted as saying. "Cricket is at heart a man's game and the MCC is consequently a masculine institution," another argued. But there are no lady members of the MCC. Wheatley's poem also served to link the issue of MCC membership to wider issues of sexism, in a world where such ideas were now thoroughly outdated. The symbolic importance of opening up the "Home of Cricket" to half the human race cannot be overstated: 1998 was subsequently labelled by Peter Hayter in Wisden as "the year the citadel fell". As was apparent during last year's World Cup, cricket as a sport has fundamentally changed in the past 20 years. The greater visibility of the global women's game has been reflected in the Lord's calendar. Prior to 1998, a mere three women's internationals had been played there. 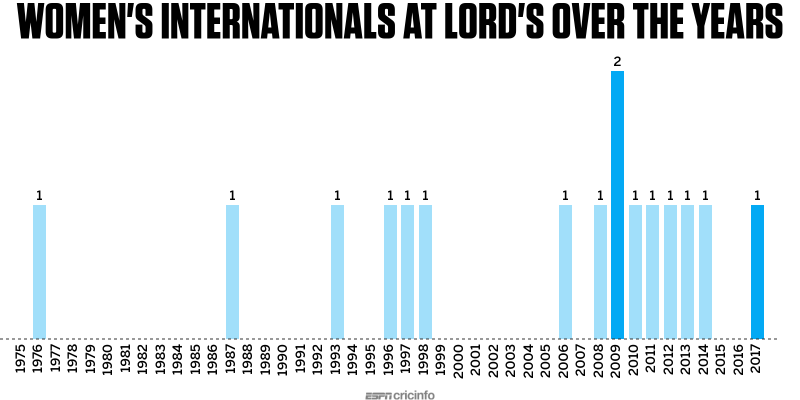 In the years since, there have been 13; between 2008 and 2014, England Women played an ODI there every summer. In 2014, the first ever MCC v Rest of the World women's match - a part of MCC's bicentenary - featured some of the biggest names in women's cricket. The significance of the 1998 vote is obvious when one considers the enormous meaning that Lord's as a ground - and by extension, MCC - holds for female cricketers. Tushar Arothe, India Women's coach during last summer's World Cup campaign, reported that he could barely keep the excitement of his players in check when they passed by the ground two days before the final: "They were just crazy [excited] to be in the final and play at Lord's." India may have lost that match, but for Jhulan Goswami and her team-mates, just getting to play in a World Cup final at the ground was a win in itself: "It was a dream come true," Goswami has said in subsequent interviews. In September 2016, former India captain Anjum Chopra became the first Indian female to be awarded with an honorary lifetime membership of MCC. Chopra, who threw a party in Delhi to celebrate the award, was quoted at the time as saying: "It's a great honour. I think it means a lot for Indian cricket as well. I hope I will be able to inspire more girls in India to take up sports as a career." Chopra's reaction, and those of the 64 other women around the world who have received honorary membership - a list that includes Charlotte Edwards, Debbie Hockley and Belinda Clark - indicates the veneration with which the club is regarded by women and men alike. It highlights exactly what those campaigning for female membership in the 1990s suggested: MCC may be a private club, but one with a very public face, and it happens to own the most important ground in the cricketing world. After 1998, the MCC could be held up, too, as an example for those who were trying to push on with similar campaigns in other parts of the world, a fact to which the Trinidadian writer Vaneisa Baksh can testify. In 1997, Baksh applied for membership of the men-only Queen's Park Cricket Club, sparking off what would become a ten-year campaign. "I invited the club to consider that the Marylebone Cricket Club (MCC), the custodians of Lord's, were at the time considering opening up membership to women," she wrote in a piece for the Cricket Monthly in 2016. "Change your rules now, I urged privately, do it before the MCC. Well, the MCC went and did it and QPCC did not budge." Baksh continued to campaign, and in 2007 she was finally accepted as a member. According to her, this was linked to the club's concern that it might be denied hosting rights for that year's World Cup in the Caribbean if it retained its male-only rule. Presumably, though, the fact that the QPCC's stance looked increasingly anachronistic in a world where women had been members at the "Home of Cricket" for almost a decade also played a small part in the final capitulation. There was also the fact that MCC's guardianship of the laws of cricket marked it apart from run-of-the-mill cricket clubs. Thanks to the 1998 vote, women gained the potential to share that guardianship. In 2012, Charlotte Edwards, then England captain, became the first woman appointed to the MCC World Cricket Committee. Last year New Zealand's Suzie Bates succeeded her onto the committee; she describes the role as a way of "continuing to grow the game for men and women, boys and girls around the world". Given that it was only in February 2018 that the first female director took her seat on the main board of the ICC, the role of Edwards and Bates in the MCC's World Cricket Committee has been an important development in bringing female voices to the heart of cricket's administration. 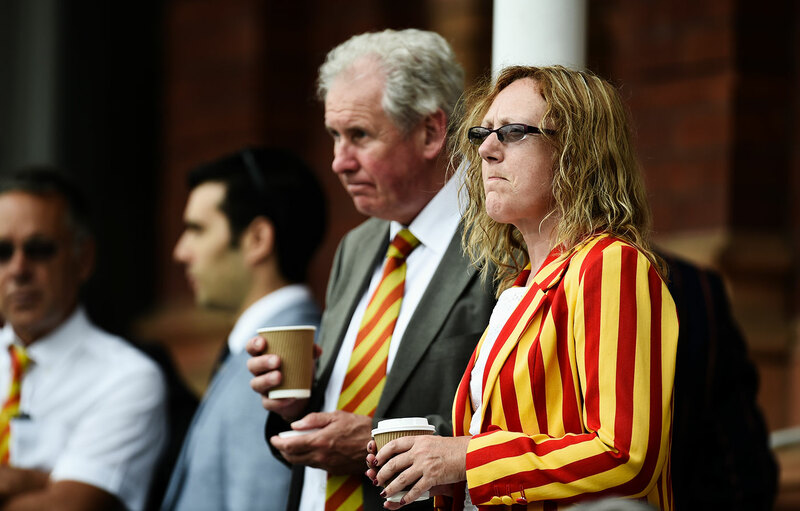 This year marks a key milestone for MCC: the first cohort of "ordinary" women members - those who put their names down for membership back in 1998, when the waiting period was 20 years long - will finally enter the pavilion as full members. It is a year where history has continued to be made at the club: back in April, Middlesex Women took to the field for their first fixture ever on the main square. In 2020, the MCC museum will for the first time stage an exhibition entirely devoted to the history of the women's game, having recently acquired the official archive of the Women's Cricket Association. MCC member Adrian Fort, in his defence of the all-male membership policy, wrote in 1998 that: "Introducing women members would alter the essence of MCC, probably forever." As the 20-year anniversary of that fateful day comes around, those alterations are surely worth celebrating. And the World Cup goes to… England!